It’s no wonder that tickets for Crazy For You at the Scarborough Village Theatre have been selling like hotcakes. It’s a spectacular high-energy, tap-dancing blast! Crazy For You is about an earnest attempt to revive a closed-up theatre in an isolated, boring town aptly named Deadrock. This effort is fueled by aspiring actor Bobby (F. Darryl Burton) from New York City, whose destiny is to work at a bank rather than on stage. His money-hungry mother Lottie (snooty Jennifer Petrilli) sends him to Deadrock to collect money from Everett (Robert Oakes), the owner of the failed theatre. Unfortunately for Bobby’s fiancée Irene (Tamara Said), Bobby ends up falling head over heels in love with Everett’s daughter Polly (Katie Wise). Comically, since saloon owner Lank (Justin Doran) wishes to marry Polly, this makes for a love rectangle. Bobby’s plan to transform the theatre requires creativity and teamwork: dancing girls are brought in from NYC, local cowboys are trained to find their rhythm, and theatre producer Bela Wrangler (Ted Powers) must be impersonated. A tall order! 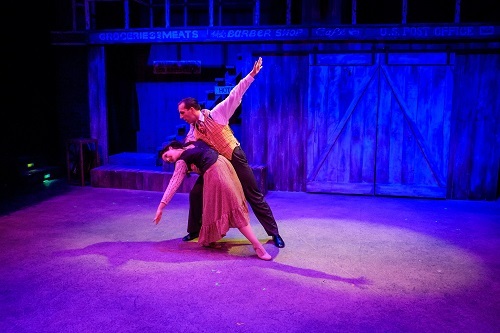 Burton and Wise give phenomenal performances as Bobby and Polly: Burton’s expansive gestures and tap dancing moves and Wise’s heartfelt singing and acting make them a wonder pair. “Embraceable You” is a memorable gift to the audience. Great chemistry is also to be found between sophisticated Irene and hotheaded Lank. I guess opposites attract. First they creatively insult each other, getting tons of laughs, and then “Naughty Baby” leads to a bold seduction scene. Tamara Said is incredible and over the top, while Justin Doran does a hilarious job of being initially surprised about her attention to being quickly won over. Some wonderfully imaginative moments: the Follies girls pop out of a creatively designed vehicle one by one on the streets of New York, the local cowboys (called “singing numbskulls” at one point) make percussion music with shovels, hammers, washboards and tin cups, and the members of the ensemble show off their tap dancing chops on a saloon table. Boosting these moments that bring joy to the audience are dynamic, mesmerizing choreography for the Follies girls (shout out to Camille Dziewurski), music that brims with romance and nostalgia, and delightful costumes and make up on the Follies girls who get to wear flapper fringes and bouncy curls. I do wish there were fewer sound issues since there was some feedback during “I Got Rhythm” which was distracting. But all in all, Crazy For You was a absolute pleasure to watch. After watching all this talent come together, I’ve already made plans to buy tickets for Mamma Mia during their next season–well in advance this time since Scarborough Music Theaatre performances sell out quickly! Remaining shows run on May 17 and 18 at 8:00 pm and on May 19 at 2:00 pm.